A sweet 16 party signifies the passage of a girl transitioning from a child into a woman. Remember your guests with fun and unique favors that represent the milestone birthday. 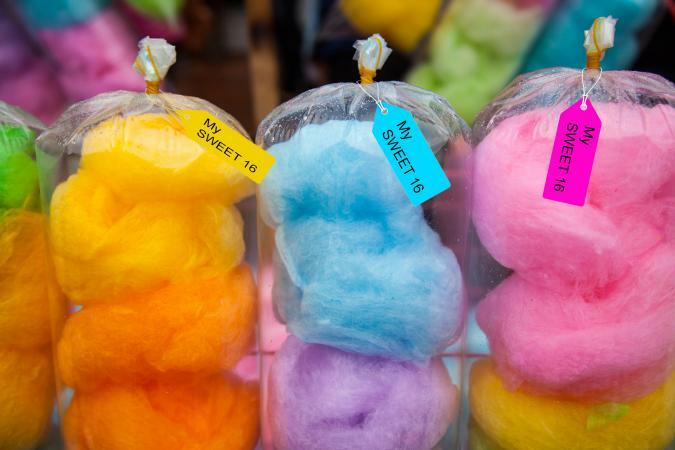 Cotton candy - Buy small bags of cotton candy and empty the contents into a clear plastic cup with lid. 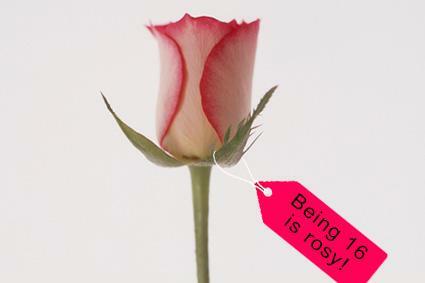 Add a personalized message on the label such as "Thank you for coming to my SWEET Sixteen." It's the perfect ending for any party, but especially one with a Candyland theme. Pedicure in a jar - Fill a mason jar or any other small jar with items for a pedicure. Include a nail file, nail polish in the party theme color, lotion, and some fun nail stickers. Top the jar with a round sticker on the lid with a "Thank you!" message. Use it for a spa or slumber party favor. Hot chocolate kit - Fill a jar with the necessary ingredients for a great hot chocolate. Include chocolate cocoa powder, mini marshmallows, and a pretty spoon or chocolate dipped spoon to mix. Include directions for making the hot chocolate at home with the thank you tag. This is perfect for a winter party. Succulents with label - These small plants are the perfect favor, especially when accompanied with a label or personalized tag. This is the perfect favor to accompany a party in the great outdoors or for the birthday girl with a love for nature. Spa gift basket - Fill small wicker baskets with everything guests will need for a spa night. This favor would work with almost any theme, but especially with a spa theme. Include a face mask, lotions, bubble bath or bath bombs and a plush washcloth. Ornament - If your party is falling around the holiday season, consider making personalized ornaments for each of your guests. You can add a "16" on the front with the year and write the name of each guest on the back. Use a clear globe ornament and a gold paint pen for the writing. Test the pen and ornament before purchasing in bulk. You might also want to fill the ornament with something in your color scheme such as shredded paper fill, glitter, or colored sand. 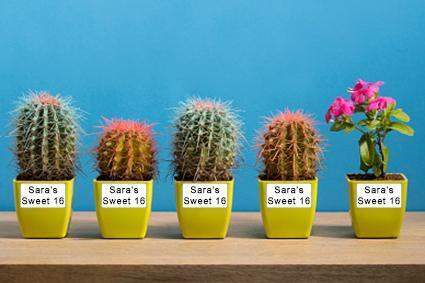 A sweet sixteen party is the perfect time to have an extra-special, personalized favor. Cookie portraits - Consider providing guests with a cookie in the image of the birthday person. It's a special way to celebrate the guest of honor. Pricing ranges varies depending on the number you select per bag, but there's a flat $25 additional design fee for all custom orders. 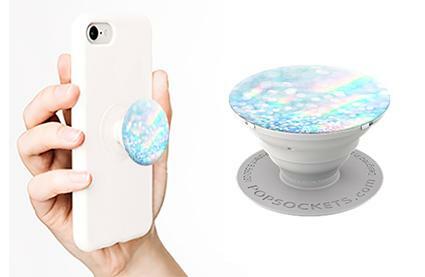 Pop sockets - Pop sockets, the small round handles that attach to the back of your phone case, are all the craze! Spoil your guests with personalized pop sockets. Pricing is about $15 each, but you can customize with your own photos! It's perfect for a small party or a big budget. Personalized sports balls - If your birthday person is a big sports fan or you are having a sports-themed party, consider a custom sports balls as a favor. The price of the balls will vary a lot depending on the vendor you choose and the quantity you order. For example, these mini-footballs cost around a dollar a piece. M&M'S - Make your own M&M's for a special, personalized favor. Choose your color and message and how you'd like to receive your special candy. The prices start as low as $9 for a small bag or personalized candies. Separate the candies into small favor boxes to share with guests. Fidget spinners - Fidget spinners are wildly popular and can be customized. Consider creating a custom spinner with the birthday girl's initials or a favorite symbol. At almost $15 a piece, this favor would work best for a small party or for someone who has a large budget. Socks - Planning on a dance? Give each guest a pair of personalized, grip bottom socks. Choose your color and your message for around $5. Consider a catchy saying such as "I danced my socks off at Birthday Girl's Party" on the tag. Sunglasses - If you are planning on a beach or Hollywood themed party, consider some personalized sunglasses as a favor. Select your favorite style, but know that pricing will vary depending on the number ordered and your selection. Pricing for orders at around a dozen is about $8 to $10 each for most designs, with costs dropping the more you order. Pink silk flowers tied with a bow - Sweet sixteen is often associated with a single pink rose. Give all your guests a simple, single pink silk flower (about $4/flower). Tie it with a pretty bow. You can even attach a thank you note to the ribbon, to thank your guests for joining you in the celebration. Molded 16 candy - Purchase molds with a "16" and make chocolate lollipops; the mold is only about $2. Use white chocolate with a touch of red food coloring to create a pink color or simply use milk chocolate. Wrap in a cellophane wrapper with a ribbon that matches your theme. Key chains - Sixteen-year-olds are just exploring the freedom of their first car (or driving mom's and dad's). Help them keep organized with this pretty key chain for $16 each. Gold frame with photo - Use these elegant gold frames as a place card at the table and a take-home gift. Fill the frames with photos of the birthday girl and each guest. Turn the photos black and white for a more elegant look. They're about $1 a piece. If you want to purchase a variety of traditional trinkets, like glow sticks, candy, pens, and more, make sure the box you package them in is worthy of the 16th birthday party. Buy small glittery boxes or larger colorful boxes, depending on the items you plan to put in it. Keep in mind that the most important thing a guest can walk away from your party with is a good memory. Be sure to take a lot of photos and share them with your friends. This can be the ultimate party favor.